Prairie Food Co-op is excited to take part in our 5th Glen Ellyn Earth Day (organized by the Glen Ellyn Park District)! barrel to one new Owner we get between NOW and the end of the festivities on Earth Day IF we receive at least FIVE new Owners in that time. 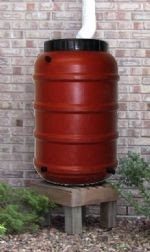 So become an Owner today and if at least four others join the PFC family, you're eligible to win this awesome rain barrel! With odds like these this is a great time to jump aboard!